Rinse the chicken livers and roughly chop, discarding any fibrous bits. Heat 1 tbsp oil in a large frying pan. When the oil is hot, add the chicken livers and cook over a high heat for about 5 minutes or until golden. Remove the livers from the pan and set aside. Add the remaining oil and reduce the heat. Add the onion, bacon and garlic and cook, stirring frequently, for 5 minutes or until the onions are soft. Add the balsamic vinegar and sherry to the mixture and continue to cook for another minute. Return the chicken livers to the pan and season with ground black pepper. 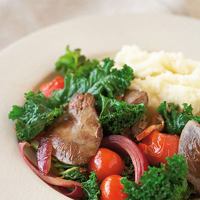 Add the kale and cherry tomatoes and continue cooking over a low heat for 5–10 minutes or until the kale just begins to wilt.